This article has been updated (in March 2016) to reflect recent changes to eurostar's bike carriage services. It's always a good idea to check what I say against the eurostar website eurostar.com:Travelling with your bike on Eurostar for updates on condi­tions and charges. 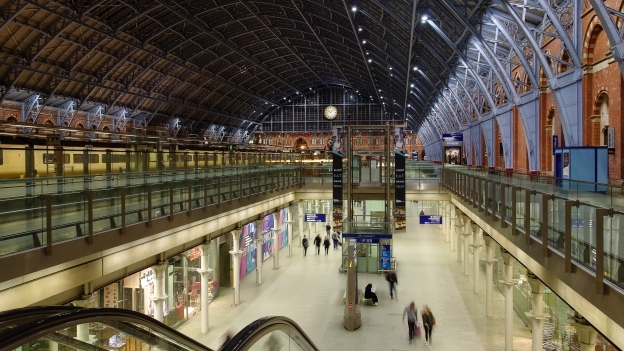 eurostar offer a quick and convenient link with mainland Europe. Taking your bike on a eurostar train isn't as simple as taking it on other UK trains, and it's also expensive when compared with other train services. If you've never done it before it can seem very complicated, but really taking your bike on eurostar is pretty straight­forward and certainly no more complicated than taking it on a plane. This guide will tell you what you need to know and what you need to do. If you're looking to change to catch a TGV service to Marseille and southern France, then putting your bike into a bag is pretty much your only option. For other destin­a­tions in France and elsewhere in Europe there are trains with bike carriage facil­ities, but carrying your bike in a bag will give you a wider choice of trains. According to EuroDespatch (who run the bike and luggage transport service) you will need to remove the wheels, seatpost/​saddle, handlebars and pedals. They will have a set of tools at the London Saint Pancras and Paris (and, I am assuming, at the other stations —but if in doubt, check). It's probably a good idea to check, before you set out, that you can undo your pedals. The boxed transport service is currently in addition to the normal bike transport service for undis­mantled bikes. eurostar are in the process of intro­ducing new trains as well as refur­bishing the old one. I don't know whether this will lead to any reduction in the number of spaces for undis­mantled bikes. If you book your place in advance it costs £30. Provided that you turn up on time, your bike travels on the same train as you do (or your bike might even get there before you. I've put that in bold because there's a lot of misin­form­ation out there. Eurostar have recently made a couple of improve­ments to the service. The first is that you can now use it if you want to go to Lille - this opens up the option of taking an onward train from Lille rather than having to change stations in Paris. The second is that the booking 'window' for bike spaces is now the same as for tickets: it used to be that the tickets were available four months in advance while the bike spaces could only be booked two months in advance - so you can check whether there are bike spaces available before you click the confirm button to buy the tickets. 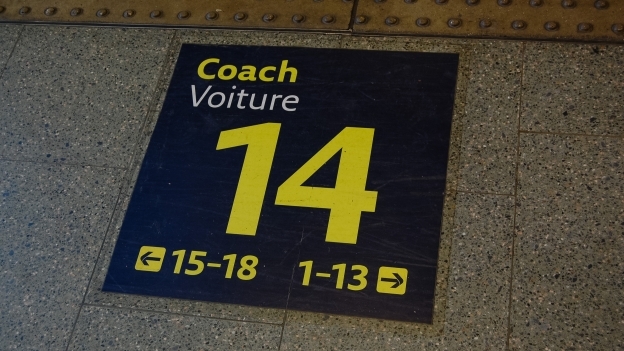 eurostar platform marker at London Saint Pancras International. Photo: Andy Mabbett. Source: Wikimedia Commons. You need to ring EuroDespatch in London on 03448 225 822 or 020 7843 7554. (There's no number in France - you have to call EuroDespatch in London even if you are travelling from France). You can also go to their office (see below for location). Make sure you have your main booking reference to hand. They accept payments over the phone by credit card and will email you the consignment note. 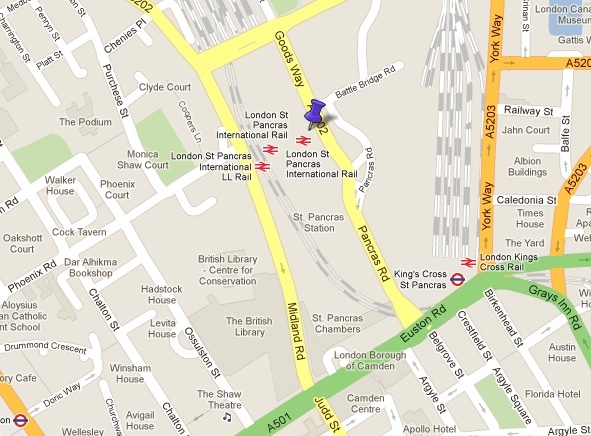 (I set these location points from memory - so don't blame me if they're a few metres out). The best thing to do is not to go into St Pancras International station but to ride beside it, towards the St Pancras domestic station, passing the M&S Simply Food shop. 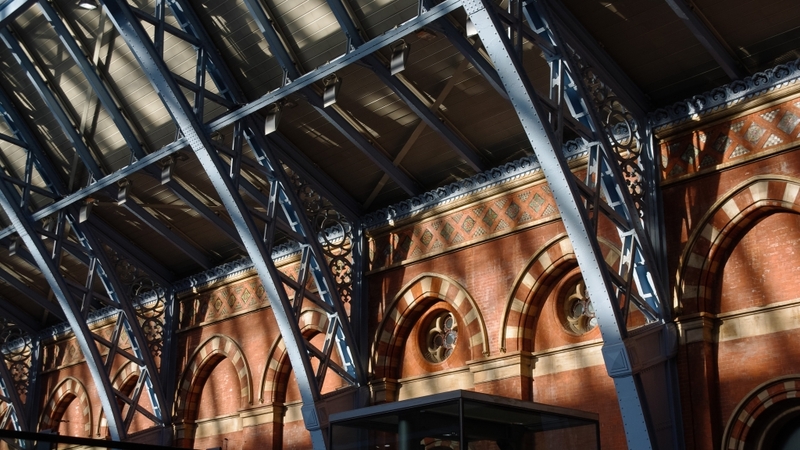 The EuroDespatch is under­neath the part of St Pancras stations that is used by domestic services. There's a trolley park by the door so if you're in luck you should be able to find a trolley for your panniers. The office is on the other side of the Eurostar security fence, so coming out of the arrivals entrance you need to turn right, and then right again following the fence. Trolleys always seem to be in pretty short supply in the Gare du Nord - so you really will have to be in luck to find one. If there's more than one of you, it might make sense to find a suitable place where one of you can stay with the bags while the other picks up the bikes. 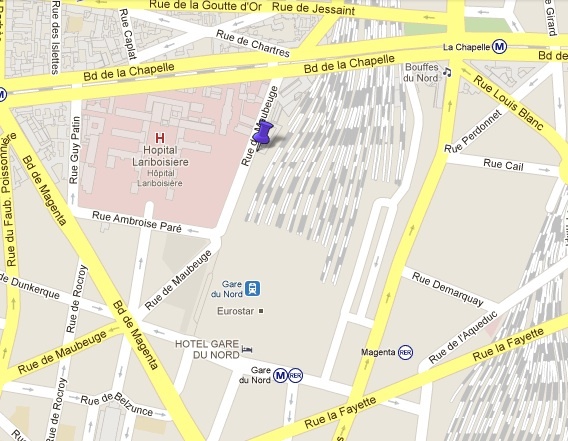 I sent EuroDespatch an email asking where the pick-up point was in Lille Europe station and within a few minutes EuroDespatch had sent me a map (thanks Bradley). The collection point is the left luggage office - shown with a blue arrow at the bottom of the map. Update: according to seat61.com you can pick up your bike from the platform. I checked with Mark (the site owner) and he said that this inform­ation came from a site user. It's probably a good idea when you get off at Lille to go to the bike compartment at the centre of the train, and even if you can't collect your bike there, you can at least check that it's been unloaded. 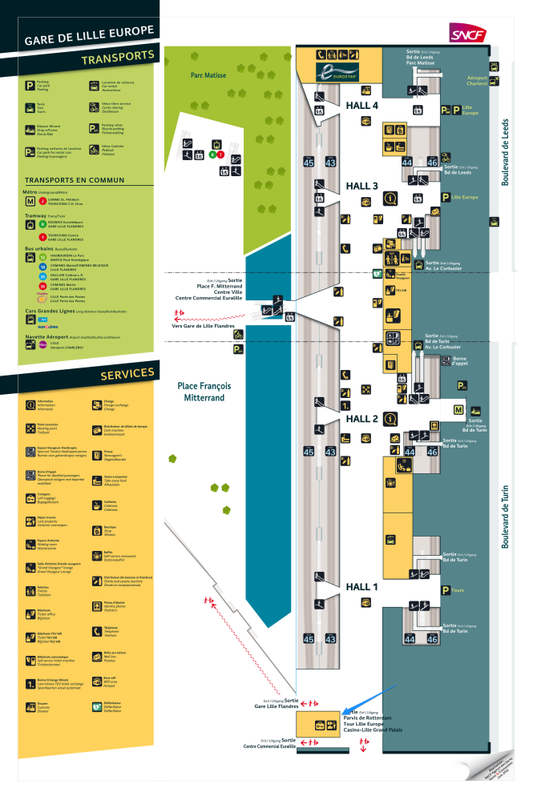 Download link for the full-size version . I would advise turning up at the station at least an hour before you depart so you've got time to find the drop-off point, and get through security and passport control. 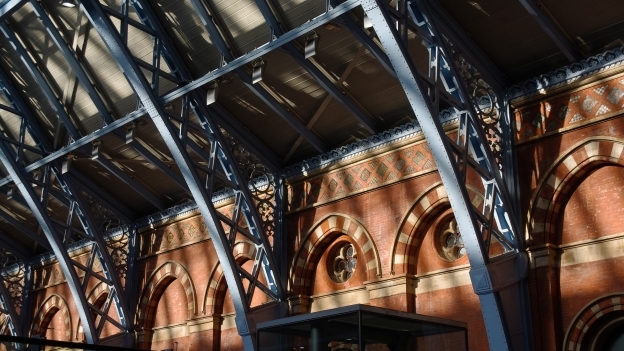 The London eurod­ispatch staff advised me that coming back from Paris at busy times such as mid-mornings in summer, it was a good idea to arrive two hours in advance (this is because these trains are popular with tour groups with lots of luggage). If you are late and your bike doesn't get loaded then it should arrive on the next train, but it's worth bearing this possib­ility in mind when booking tickets for onward trains, and leave yourself some margin for delays etc. At the time of writing this service only operates between the three main terminals so you can't get on the train at inter­me­diate stations like Ashford Kent, or Ebbsfleet etc. Sadly the service isn't available on the direct trains to Lyon, Avignon and Marseille. You can't carry gas canisters, or knives with a locking blade (eg Opinel pocket knives) on Eurostar services. I've always found the EuroDespatch staff very helpful, so if you have any questions give them a call or send them an email.